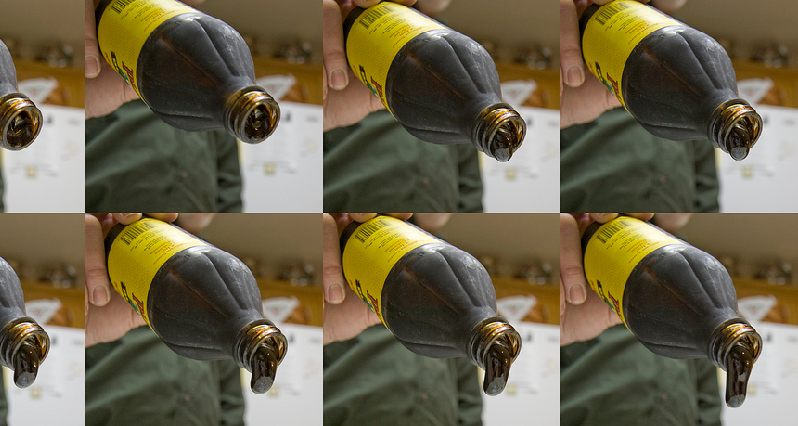 “Molasses Sequence” photograph, courtesy of Marshall via Flickr and the Creative Commons license. Flower growers have used blackstrap molasses (yes, we do sell this old-time remedy for iron poor blood!) to get stronger, longer lasting blossoms for ages. Molasses supplies trace minerals along with bio-available sugars that feed plants. Milk, too, is a soil and plant food. The organization Slow Food says that, in addition, milk is an effective fungicide and soft-bodied insecticide; critters like grasshoppers don’t have a pancreas to process the sugars, so they are driven off when milk is applied to leaves. Slow Food says to mix two cups of milk (whole) into eight cups of water and stir in ¼ cup of blackstrap molasses for the first feeding (spray on leaves or pour a cup of the mixture around the stem of each plant). Do this every two weeks to nurture healthy communities of microbes, fungi and beneficials in compost or garden soil.